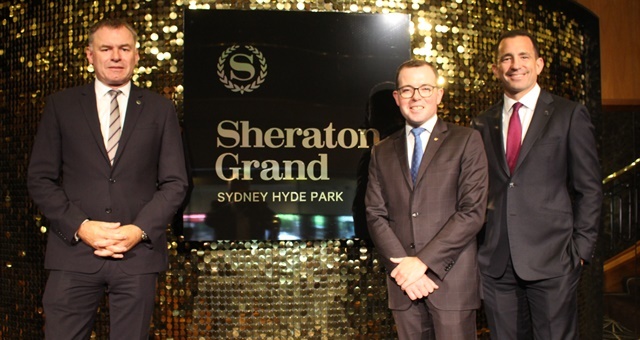 L-R Sheraton Grand Sydney Hyde Park GM David Fraser, NSW Minister for Tourism Adam Marshall and Marriott International VP Brand & Marketing APAC, Mike Fulkerson. Sydney’s iconic Sheraton Grand Sydney Hyde Park last night capped off a four-year transformation from its former identity to a new luxury name, celebrating with over 800 industry partners, friends and colleagues at a glamourous party. 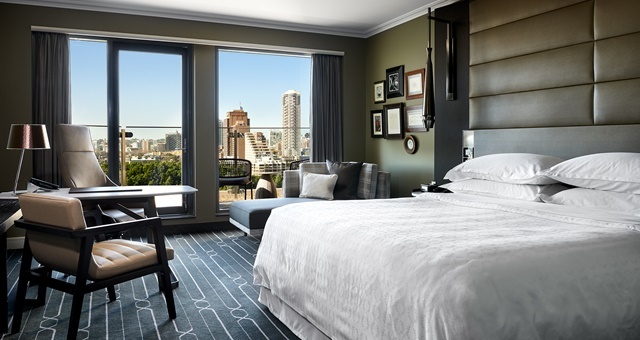 Formerly the Sheraton on the Park, the title change to Sheraton Grand Sydney Hyde Park came following a $50 million renovation which saw all rooms receive a makeover to a more refined, modern style and lounges revamped with upgraded furniture and a new look overall. Coinciding with the hotel relaunch was the fourth stop in Sheraton’s global ‘Heart For The City’ tour which sees an area of the hotel decorated with a series of themed vignettes celebrating Sheraton’s impact on the city in which it resides. Check out Sydney’s vignettes HERE. Over the course of a year, Heart For The City will visit hotels in Saint Hyacinth (near Montreal) before moving to Seattle, Cairo, Sydney, Santos, Bengaluru and concluding in Beijing. In Sydney, the theme ‘High Tea meets Hyde Park’ sees the hotel’s Castlereagh Rooms adorned in highly Instagrammable leafy green walkways alongside giant high tea desserts, teacups, a library and honeycomb. The new-look Executive Terrace Park View Room at Sheraton Grand Sydney Hyde Park. In upgrading the Sheraton Sydney brand, the hotel will also gradually implement a number of initiatives aimed at engaging the community. A variety of technology-driven spaces will be developed as a new Sheraton standard including communal dining, studios for groups to gather and new dining menus rolled out at restaurants which previously were closed during the day. Marriott International VP Brand & Marketing Asia Pacific, Mike Fulkerson, said in transforming Sheraton hotels in line with the global brand relaunch, Sheraton designers were aiming for a sense of consistency but also a sense of community. “How do I create a sense of consistency so that when I go into a hotel in the US, it feels like it’s part of the same brand but is not cookie-cutter. I want to know that I’m in Boston or Washington D.C or Shanghai or Beijing but I also want to know I’m in a Sheraton. We strike that balance of being consistent but also being of the place where the hotel is located”. Sheraton Grand Sydney Hyde Park General Manager, David Fraser, said multiple designers were used throughout the hotel to ensure every space had been given a fresh approach. “We wanted to incorporate all aspects of the Sheraton brand, focusing on the key location that we have, Sydney being a gateway city, bringing the design of Hyde Park into all aspects of the hotel and really looking at how we interact with the community.